Brief Description: When Kenny Ball and John Bennett co-founded a trad jazz band back in 1958, little did they know that more than 50 years later they would still be recording together and enjoying a strong and enduring partnership built on firm friendship, shared musical philosophy and total respect, not to mention a wicked and highly infectious sense of humour. Kenny Ball and his Jazzmen, with Kenny playing trumpet and John on trombone, had a string of hits during the 1960s including ‘Midnight in Moscow’, which sold over one million copies and earned gold disc status. This early success set the band on the road to international stardom, rubbing shoulders with many music legends, and guaranteed their place as one of the most influential bands in the history of trad jazz. The dynamic duo share their hugely entertaining Musical Skylarks memoirs in a style that will engage all readers, jazz fans or not, with hilariously funny anecdotes about on-stage and behind-the-scenes antics and myriad fascinating characters leaping out of every page. What will become clear is that the wild times didn’t start with the rock ’n’ roll era and the band’s signature tune definitely wasn’t ‘Ain’t Misbehavin’’! About the Author: Kenny Ball: Kenny Ball was born in Ilford, Essex in 1930. He started his musical career as a sideman playing for bands during the evenings whilst holding down a day job as a salesman. 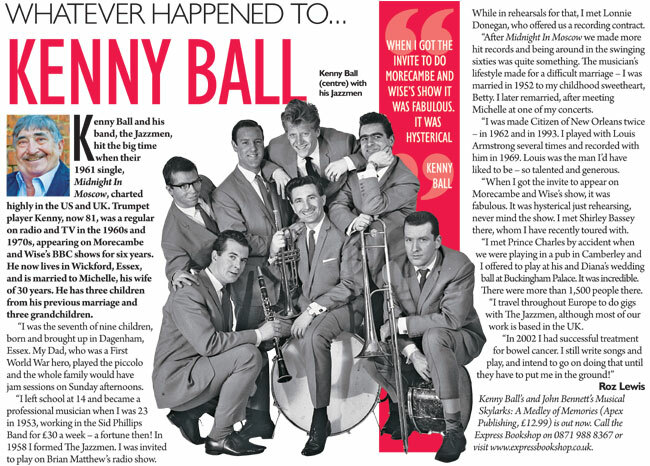 In 1958, Kenny formed his own band, Kenny Ball and his Jazzmen. With Kenny on lead vocals and trumpet, he and his Jazzmen set out to transform traditional jazz. The band produced a string of hits including Midnight to Moscow, Samantha and When I’m 64 placing them at the forefront of the 1960s’ jazz revival and bringing Kenny worldwide acclaim. Kenny is one of the most enduring jazz artists of all time and a living legend. Now, at the age of 80, after 50 years in the music business, he continues to record with his current band of Jazzmen including his good friend John Bennett from the original line-up. Kenny lives in the Essex countryside with his wife Michelle. John Bennett: John Bennett was born in Clapton, East London in 1936. After leaving school he worked in an advertising agency for a short period before being called up for his National Service in the Army in 1954. During this time he was stationed in London and was able to play trombone with several jazz bands in the London area. A few months after finishing his National Service John joined the Terry Lightfoot Jazzmen and turned pro in the autumn of 1956. Two years later, John and Kenny became acquainted when Kenny joined the Lightfoot band, and in late 1958 they both left to form the Kenny Ball Jazzmen. The foreword will appear here shortly. Years ago, whenever my family celebrated New Year, my grandparents engaged in a rather charming ritual. 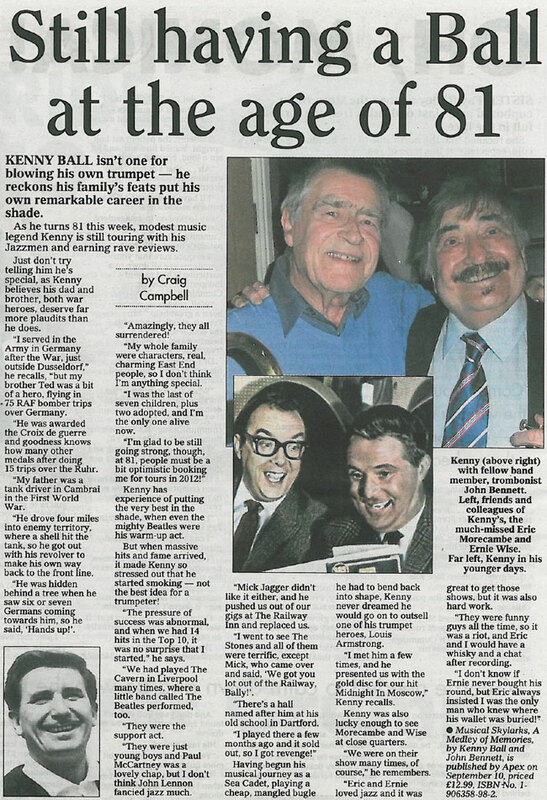 As the clock ticked towards midnight, my grandfather would dig out several LPs and treat the gathered throng to the likes of Jimmy Shand and his Band, Acker Bilk and, finally, the legendary Kenny Ball and his Jazzmen. I was chatting to Kenny the other day, and Jazz fans will be pleased to know that this incredibly active octogenarian is still touring with his band and plays to packed houses both in the UK and abroad. Listing the man’s achievements would take too long – he’s been accumulating them since the 1950s – but being asked to play at the wedding of Prince Charles and Lady Diana has to come near the top of the pile. On December 3, 1953, Kenny attended an audition for trumpeter with the Sid Phillips band. He got the job. I asked Kenny if he’d had a lucky break that gave him his shot at stardom. Lonnie, often called “the King of Skiffle”, was already a superstar in the music business, and after the show he asked Kenny if he had a recording contract. Kenny said he didn’t. “Well, you’ve got one now”, said Lonnie. This was followed by appearances on Lonnie’s TV show and the London Palladium. Watch Kenny as he strolls onto the stage and you’ll see a man who is comfortable with himself; confident, smiling and seemingly at ease with the world. He puts audiences at ease, because you can just tell he’s a genuinely nice guy. He just has that aura about him. And yet, what Kenny told me next stunned me. “Yes, even now I still get a bit stage-shy before performances”. That was the last thing I’d expected to hear, but when I’d recovered my composure I asked him how he coped. “You know, for a long time now I’ve done the same thing – I talk to my mother even though she’s no longer here. She was an incredibly strong person – a wonderful woman – and when I feel low, or lacking in confidence, I chat to her. And you know what? Suddenly I’ll feel relaxed, confident. Then I’ll go on stage”. I asked Kenny who the most influential person was he’d ever worked with. Kenny told me that his apprehension about performing often manifests itself in vivid dreams. “I’ll dream that I’m playing, and suddenly my trumpet falls to pieces, or I’ll be unable to find my mouthpiece. The point is that I have to rely on outside help, you could say. I think everyone has to do that at times in their lives”. And he’s right, of course. 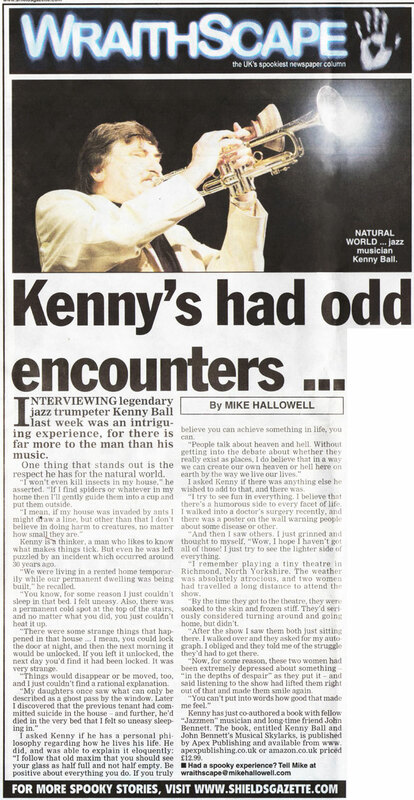 Next week I’ll let Kenny Ball tell readers about a number of odd experiences he’s had during his star-studded career, and they’re fascinating indeed. Meanwhile, you can learn an awful lot more about Kenny by reading a book he’s just co-authored with fellow “Jazzmen” musician and long-time friend John Bennett. 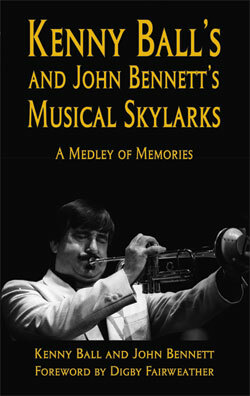 The book, entitled Kenny Ball and John Bennett’s Musical Skylarks is published by Apex Publishing and available from http://www.apexpublishing.co.uk or amazon.co.uk and is priced at £12.99. Interviewing legendary jazz trumpeter Kenny Ball last week was an intriguing experience, for there is far more to the man than his music. One thing that stands out is the respect he has for the natural world. “I won’t even kill insects in my house”, he asserted. “If I find spiders or whatever in my home then I’ll gently guide them into a cup and put them outside. I mean, if my house was invaded by ants I might draw a line, but other than that I don’t believe in doing harm to creatures, no matter how small they are”. Kenny is a thinker, a man who likes to know what makes things tick. But even he was left puzzled by an incident which occurred around thirty years ago. “We were living in a rented home temporarily whilst our permanent dwelling was being built”, he recalled. “You know, for some reason I just couldn’t sleep in that bed. I felt uneasy. Also, there was a permanent cold spot at the top of the stairs, and no matter what you did, you just couldn’t heat it up. “There were some strange things that happened in that house...I mean, you could lock the door at night, and then the next morning it would be unlocked. If you left it unlocked, the next day you’d find it had been locked. It was very strange. “Things would disappear or be moved, too, and I just couldn’t find a rational explanation. My daughters once saw what can only be described as a ghost pass by the window. Later I discovered that the previous tenant had committed suicide in the house – and further, he’d died in the very bed that I felt so uneasy sleeping in”. “I follow that old maxim that you should see your glass as half full and not half empty. Be positive about everything you do. If you truly believe you can achieve something in life, you can. People talk about heaven and hell. Without getting into the debate about whether they really exist as places, I do believe that in a way we can create our own heaven or hell here on earth by the way we live our lives”. I asked Kenny if there was anything else he wished to add to that, and there was. “I try and see fun in everything. I believe that there’s a humorous side to every facet of life. I walked into a doctor’s surgery recently, and there was a poster on the wall warning people about some disease or other. And then I saw others. I just grinned and thought to myself, “Wow, I hope I haven’t got all of those! I just try and see the lighter side of everything”. “I remember playing a tiny theatre in Richmond, North Yorkshire. The weather was absolutely atrocious, and two women had travelled a long distance to attend the show. By the time they got to the theatre they were soaked to the skin and frozen stiff. They’d seriously considered turning around and going home, but didn’t. “After the show I saw them both just sitting there. I walked over and they asked for my autograph. I obliged and they told me of the struggle they’d had to get there. Now for some reason these two women had been extremely depressed about something – “in the depths of despair”, as they put it – and said listening to the show had lifted them right out of that and made them smile again. You can’t put into words how good that made me feel”. 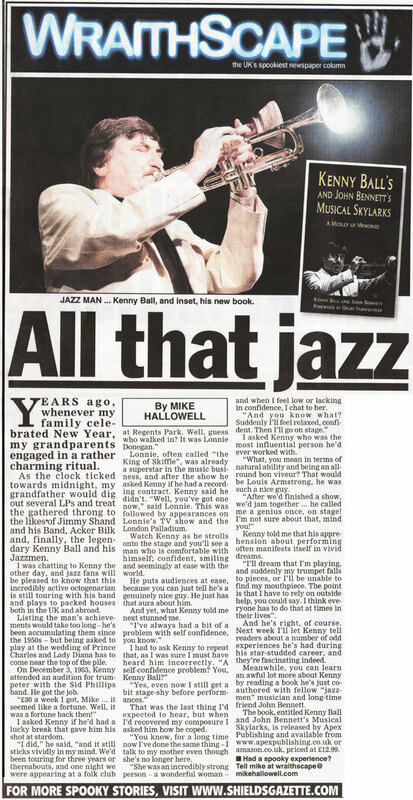 Kenny has just co-authored a book with fellow “Jazzmen” musician and long-time friend John Bennett. 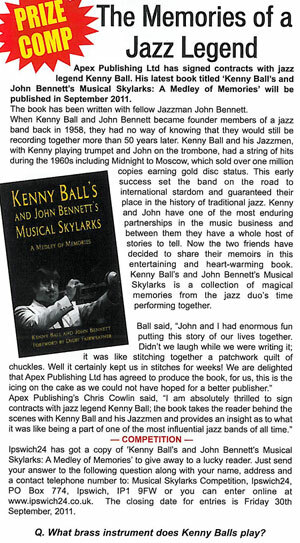 The book, entitled Kenny Ball and John Bennett’s Musical Skylarks, is published by Apex Publishing and available from http://www.apexpublishing.co.uk or amazon.co.uk and is priced at £12.99. IT would be odd if Kenny Ball didn’t have a few rich tales to tell. This is a man who has worked and partied with immortals, including the Beatles, Princess Diana, Frank Sinatra, and Morecambe and Wise, not to mention his idol, Louis Armstrong. He has travelled around the world 17 times making music along the way.Above all, he has shown an astonishing ability to defy showbiz gravity. Other legends have come and gone, Kenny has just bounced along at the top. He had his first hit, Samantha, in 1960. Over the next half century, musical tastes changed with rapidity, but the audience for Kenny’s records and concerts barely diminished. With 14 Top 30 records, he holds the record for the most successful jazz artist in British musical history. Along the way, he has acquired a choice crop of stories, and now, finally, he has decided the time has come to share them with the rest of the world. A case of reminiscing in retirement? Not a bit of it. Kenny, a born and bred Essex man, now lives in Wickford. That, though, his only concession to leisured old age. He continues to blow his trumpet in venues around the UK and Europe, often performing several concerts a week. This year, however, he did pause long enough to set down his reminiscences in a book, Kenny Ball’s and John Bennett’s Musical Skylarks: A Medley of Memories. His co-author, John Bennett, is the trombonist in the band, Kenny Ball’s Jazzmen. John has played alongside Kenny, non-stop, since 1957. 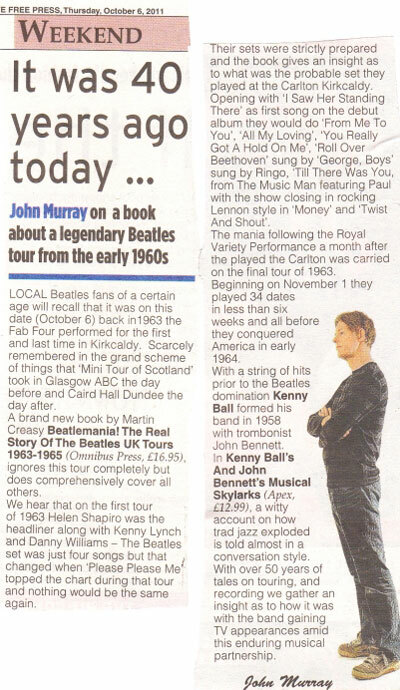 Says Kenny: “John has kept this scrapbook, which goes right back to the start, and is right up to date. Kenny Ball was born in Mayesbrook Road, Dagenham, in 1930. His musical talent was obvious from the start, and encouraged by his father, who played in the Salvation Army Band. In 1956, Kenny joined Eric Delaney’s band and became fully professional. But his talent and personality were too strong for him to remain in the back row for long, and the following year he formed the Jazzmen. The lads set out with two aims in mind, to make music and have a ball. Jazzmen have never been a byword for sobriety, and Kenny Ball’s Jazzmen had no intention of changing that image. “Whatever our signature tune, it was never going to be Ain’t Misbehavin’,” says Kenny. After their initial success in Britain, the band cut a swathe through the concert halls and bars of Europe. One night in Germany, after another heavy night’s boozing, the crew went to sleep in their shared boarding-house dormitory. Kenny was woken up in the middle of the night “by a weird sort of clapping sound”. He recalls: “It went on and on. In the end I turned the light on to see what was happening. I found our guitarist Dickie Bishop’s underpants were glowing. Also in Germany, the band stayed in lodgings presided over by a tyrannical landlady, Frau Behrens, who ran the boarding house like a one-woman dictatorship. Kenny says: “She had a picture on the wall, which she idolised. We thought it was Adolf Hitler, which you could believe, given the way she behaved. We used to throw darts at it. The rough and ready days didn’t last long, and boarding houses were soon exchanged for luxury hotels. The Jazzmen hit the stratosphere one day in April 1960. In what must amount to the ultimate showbiz fairy story, they landed a TV show and a major recording contract, all in the space of less than one minute. Lonnie Donegan, one of the big stars of the era, heard them rehearsing in London , and sidled up to them. “Then you’ve got one,” said Lonnie. Lonnie was as good as his word in both instances. Only later did Kenny discover that Lonnie acted as an A&R man as well as a performer in his own right. By May 1961, the Jazzmen were playing a two-week stint at the Palladium, then the world’s most famous live performance venue. On the day they signed off from the London theatre, they rushed back to Kenny’s home patch and performed in Southend for the first time – at the end of the pier. Earlier that year the Jazzmen had been playing a gig up north. During the interval, the crowd was entertained by a local amateur band. It was Kenny’s first encounter with the Beatles, then known as the Silver Beatles. In a later encounter with Paul McCartney, the great man declared himself a great fan of Kenny Ball’s Jazzmen. Another fan turned out to be Kenny’s own idol, Louis Armstrong. The pair met for the first time in 1962 when the great Satchmo presented Kenny with a golden – million-seller – disc for the band’s hit Midnight in Moscow. In 1968, the Jazzmen provided the warm-up act for Armstrong when he performed at London’s New Victoria theatre. He then rushed on to the stage in his dressing gown and embraced Kenny. After the pair had been acquainted for a while, Jeannie showed Kenny her collection of match-boxes, each one labelled with a famous name. Jeannie used to snip off a few locks of hair from each of her conquests and store them in a matchbox. The names included Duke Ellington, Louis Armstrong, every member of the Louis Armstrong All Stars, and every member of the Count Basie band. The Kenny Ball Jazzmen were at their most prominent when they did a four-year regular stint on the Morecambe and Wise Show. Eric and Ernie used the band as a sounding board for their routines. “If we laughed at a joke, it stayed in,” says Kenny. The show’s guests included most of the biggest stars of the day, and the band got a front row view of them all. The band was dropped from Morecambe and Wise when the comedians moved from the BBC to ITV, but simply moved to another popular show, Saturday Night at the Mill, where they were a regulars from 1976 to 1981. After that they headed back on the road, performing live to audiences around the world. Their brand of cheery British jazz stayed popular everywhere – the US, Australia, even behind the Iron Curtain. It has never lost its popularity. Perhaps the most illustrious moment of all for Kenny Ball and the Jazzmen came when they were invited to provide the music for Prince Charles and Princess Diana’s wedding party, at Buckingham Palace. “All I could see over my trumpet ball was bobbing tiaras,” Kenny says. As a raconteur, Kenny proves himself a man of words as well as a man of music. On stage, he always managed to make audiences laugh as well as tap their toes. The words almost dry up, however, when he is asked the crucial question. He has pulled in the audiences for 54 years non-stop. What gives him his staying power? l Kenny Ball will sign copies of his book at Waterstone’s Bookshop, Eastgate shopping centre, Basildon, on Saturday, from 1pm until 3pm. Musical Skylarks: A Medley of Memories, is published by Apex and is priced at £14.99. When I was a kid, playing Kenny Ball & his Jazzmen at our family's Christmas and New Year parties was mandatory. This book is a five-star cruise through an ocean of musical nostalgia. Absolutely superb. 29 November 2010 - Kenny Ball was interviewed on Wolverhampton City Radio 101.8 FM. Kenny answered questions about his book 'Kenny Ball's and John Bennett's Musical Skylarks'. 14 September 2011 - Kenny Ball was interviewed on BBC Radio Lincolnshire 94.9 FM. Kenny answered questions about his book 'Kenny Ball's and John Bennett's Musical Skylarks'. 17 September 2011 - Kenny Ball was interviewed on Radio Borders. Kenny answered questions about his book 'Kenny Ball's and John Bennett's Musical Skylarks'. 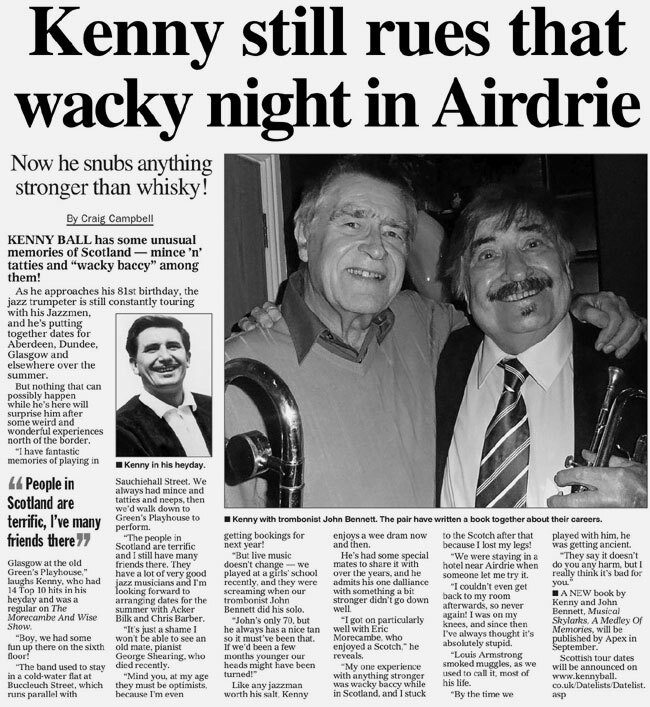 23 September 2011 - Kenny Ball was interviewed on Leith FM by Graeme Logan. 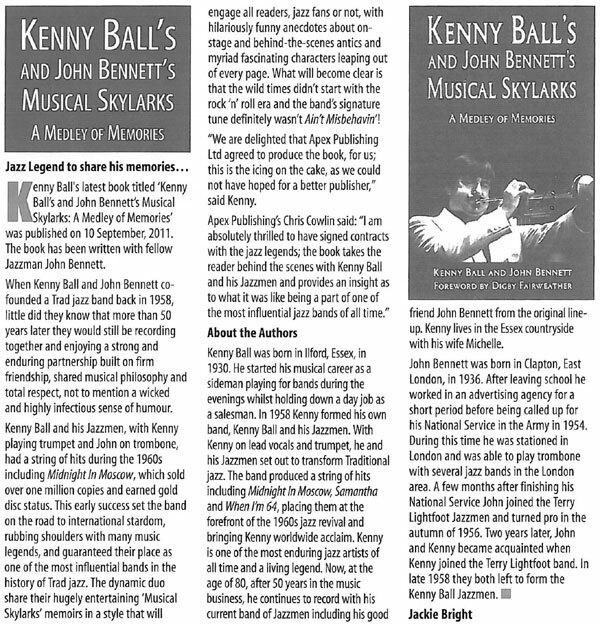 Kenny answered questions about his book 'Kenny Ball's and John Bennett's Musical Skylarks'. 22 September 2011 - Kenny Ball was interviewed on Bradford Community Radio 106.6 FM. 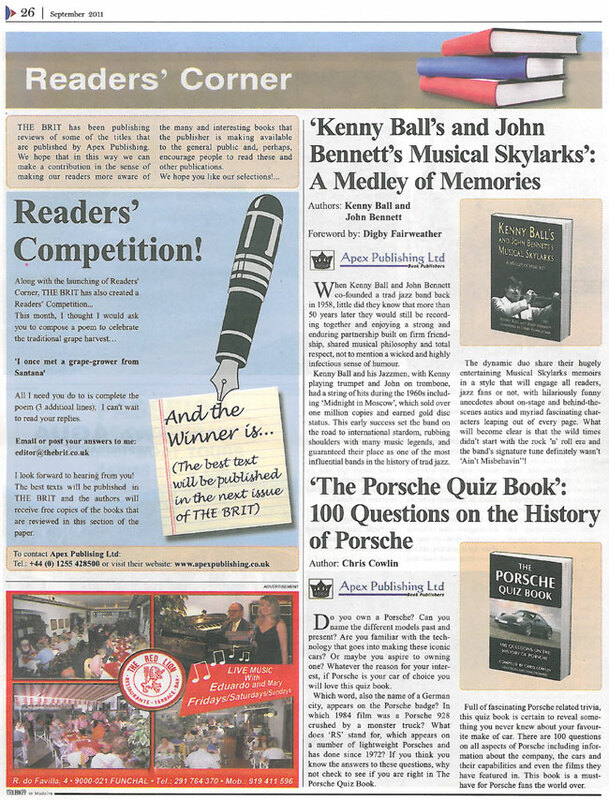 Kenny answered questions about his book 'Kenny Ball's and John Bennett's Musical Skylarks'. 22 September 2011 - Kenny Ball was interviewed on Angel Radio. Kenny answered questions about his book 'Kenny Ball's and John Bennett's Musical Skylarks'. 23 September 2011 - Kenny Ball was interviewed on Radio Six International. Kenny answered questions about his book 'Kenny Ball's and John Bennett's Musical Skylarks'. 23 September 2011 - Kenny Ball was interviewed on Leith 98.8 FM. Kenny answered questions about his book 'Kenny Ball's and John Bennett's Musical Skylarks'. 23 September 2011 - Kenny Ball was interviewed on Pulse 98.4 FM. Kenny answered questions about his book 'Kenny Ball's and John Bennett's Musical Skylarks'. 28 September 2011 - Kenny Ball was interviewed on BBC Radio West Midlands 95.6 FM. Kenny answered questions about his book 'Kenny Ball's and John Bennett's Musical Skylarks'. 9 October 2011 - Kenny Ball was interviewed on BBC Radio Kent 96.7 FM. Kenny answered questions about his book 'Kenny Ball's and John Bennett's Musical Skylarks'. 10 October 2011 - Kenny Ball was interviewed on BBC Radio York 103.7 FM. 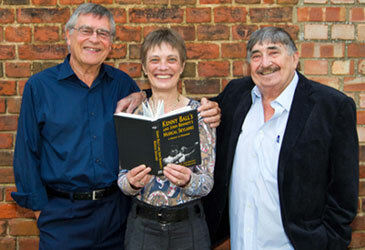 Kenny answered questions about his book 'Kenny Ball's and John Bennett's Musical Skylarks'. 13 October 2011 - Kenny Ball was interviewed on BBC Radio Devon 103.4 FM. 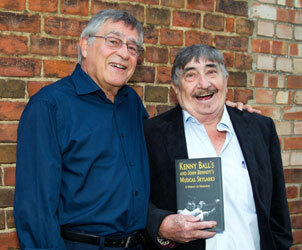 Kenny answered questions about his book 'Kenny Ball's and John Bennett's Musical Skylarks'. 13 October 2011 - Kenny Ball was interviewed on BBC Radio Essex 103.5 & 95.3 FM. 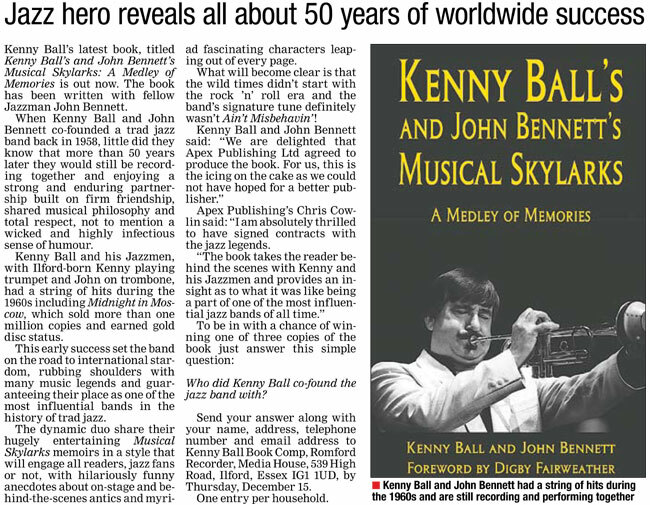 Kenny answered questions about his book 'Kenny Ball's and John Bennett's Musical Skylarks'. 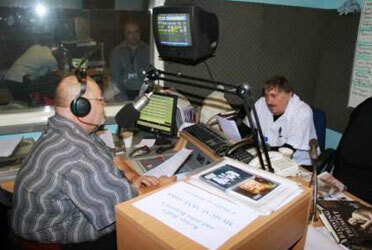 17 October 2011 - Kenny Ball was interviewed on Basildon Hospital Radio. Kenny answered questions about his book 'Kenny Ball's and John Bennett's Musical Skylarks'. 6 November 2011 - Kenny Ball was interviewed on Radio Borders. Kenny answered questions about his book 'Kenny Ball's and John Bennett's Musical Skylarks'. 21 November 2011 - Kenny Ball was interviewed on Wythenshawe 97.2 FM. Kenny answered questions about his book 'Kenny Ball's and John Bennett's Musical Skylarks'. 22 November 2011 - Kenny Ball was interviewed on Leith 98.8 FM. Kenny answered questions about his book 'Kenny Ball's and John Bennett's Musical Skylarks'. 6 February 2012 - Kenny Ball was interviewed on Bolton 96.5 FM. Kenny answered questions about his book 'Kenny Ball's and John Bennett's Musical Skylarks'. 28 June 2012 - Kenny Ball was interviewed on BBC Radio 2. Kenny answered questions about his book 'Kenny Ball's and John Bennett's Musical Skylarks'. An essential and nostalgic reference book for lovers of British traditional jazz. 14 September 2011 - Kenny Ball and John Bennett signed copies of their book 'Kenny Ball's and John Bennett's Musical Skylarks' at Bookmark, Spalding. 5 October 2011 - Kenny Ball and John Bennett signed copies of their book 'Kenny Ball's and John Bennett's Musical Skylarks' at Waterstone's, Macclesfield. 19 October 2011 - Kenny Ball signed copies of his book 'Kenny Ball's and John Bennett's Musical Skylarks' at Waterstone's, Epsom. 5 November 2011 - Kenny Ball and John Bennett signed copies of their book 'Kenny Ball's and John Bennett's Musical Skylarks' at Waterstone's, Basildon. 3 December 2011 - Kenny Ball and John Bennett signed copies of their book 'Kenny Ball's and John Bennett's Musical Skylarks' at Waterstone's, Lakeside Shopping Centre, Thurrock. 10 March 2012 - Kenny Ball and John Bennett signed copies of their book 'Kenny Ball's and John Bennett's Musical Skylarks' at Waterstone's, Hitchin.